Madison Square Park has turned Worth Square, the small traffic island just west of the park, into a foodie haven for the fall season with the reopening of Madison Square Eats this past weekend. Open from 11am until 9pm everyday until October 19, Madison Square Eats is the perfect spot for lunch (if you can sneak out of the office) or dinner to share a variety of foods with your date. Whether you’re hungry for a full meal of savory items from pizza to pork buns or craving a sweet treat, like a mini cannoli or an ice cream sandwich, you’ll find exactly what you’re in the mood for at Madison Square Eats! Ilili may be best known for their Lebanese dishes like Kibbeh and Tabbouleh, but it’s their Green Lemonade that everyone’s sipping alongside every meal at Madison Square Eats for $4 a cup. This sweet lemonade is made with mint, cucumber and ginger and is now known as “crack juice” among fellow Madison Square Eats vendors, who just like the rest of NYC can’t get enough of this crisp and refreshing lemonade. Bushwick’s hip spot for delicious eats and the summer’s wildest Sunday Funday party, Tiki Disco, serves piping hot personal sized thin crust pizzas. 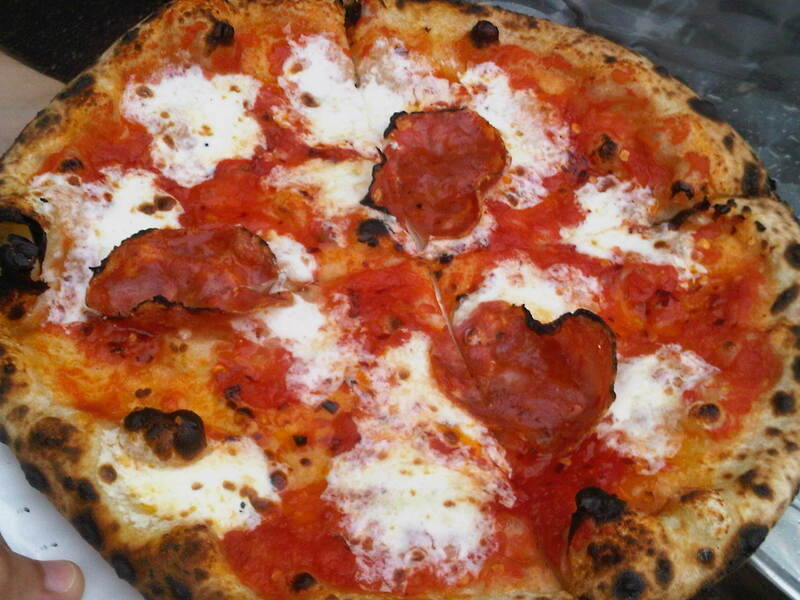 The Bee Sting (mozzarella, tomato, soppressata, chili oil and honey) gives you a spicy kick in the mouth with a sweet way to soothe the burn. Classic Ragu or Signature Nutella Rice Ball from Arancini Bros.
Arancini Bros. is New York's first and only company specializing in Sicilian rice balls. Flavors are rotating at Madison Square Eats, including the standard meat ragu with peas to a spicy and creamy buffalo chicken. Don’t miss the Ragu, but if you’re in a dessert mood, their Nutella rice ball is so popular they sell out most nights, so make sure to grab one early! 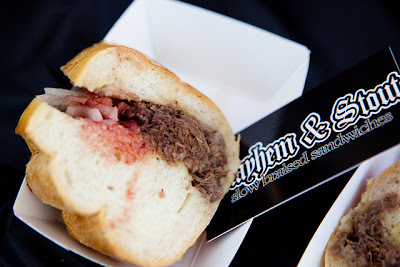 Serving their slow braised sandwiches at food fairs around the city, Mayhem and Stout knows how to prepare juicy, tender meat with creative sauces stuffed into fresh bread. Order a Short Rib and Brisket Sandwich with Maple Brown Sugar Sriracha, topped with green onion and chive for a spicy kick with a sweet finish. The meat and sauce literally melts in your mouth, making it one of the best brisket sandwiches in NYC. When you can’t make a decision between a spiced dry rub or messy sauced up ribs, you can enjoy both with a $16 combo platter at Baby Got Back Ribs. Served with jalapeño cornbread and apple slaw, this hearty Southern plate has Middle Eastern influences in the dry rub mixture, balancing out the sweet and gooey sauce on the bbq ribs. For $1 more try their Almost Sweet Tea. Don’t forget to grab a few wet wipes! 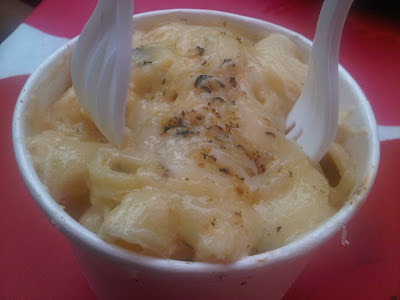 Lobster Mac N Cheese from Red Hook Lobster Pound. Always debating just who has the best lobster roll in NYC? Check out Red Hook Lobster Pound for a Maine Roll, featuring Maine lobster meat, a touch of homemade mayo, a bit of celery and spices or try a Connecticut Roll with lobster and warm butter. Want comfort food? Their creamy Lobster Mac N Cheese is perfect to get cozy this fall with chunks of lobster meat covered in melted cheese and noodles. It's never too cold out for ice cream sandwiches! Enjoy sweet cinnamon ice cream wedged between two soft snickerdoodle cookies this fall at Madison Square Eats or try one of their other rotating ice cream and cookie combos. 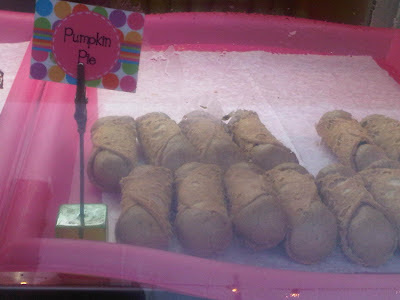 The Cinnamax is also available at The Big Gay Ice Cream Shop daily, among other popular Melt Bakery ice cream sandwiches. With a long list of rotating flavors each week, choose from seasonal favorite Pumpkin Pie to Mud Slide, a chocolate lover’s dream. You can enjoy these mini cannoli in just a couple bites, so try a few flavors each time you visit. Who doesn’t love Momofuku Milk Bar? Grab their always popular Birthday Cake Truffles at Madison Square Eats, sold in packages of 3 to snack as you walk through the park or order a gift box dozen for the perfect housewarming gift (if you can promise to not eat them all by yourself at home in pjs). For a full list of vendors. Madison Square Eats at 24th & Broadway. Open daily, 11am-9pm until Oct. 19. 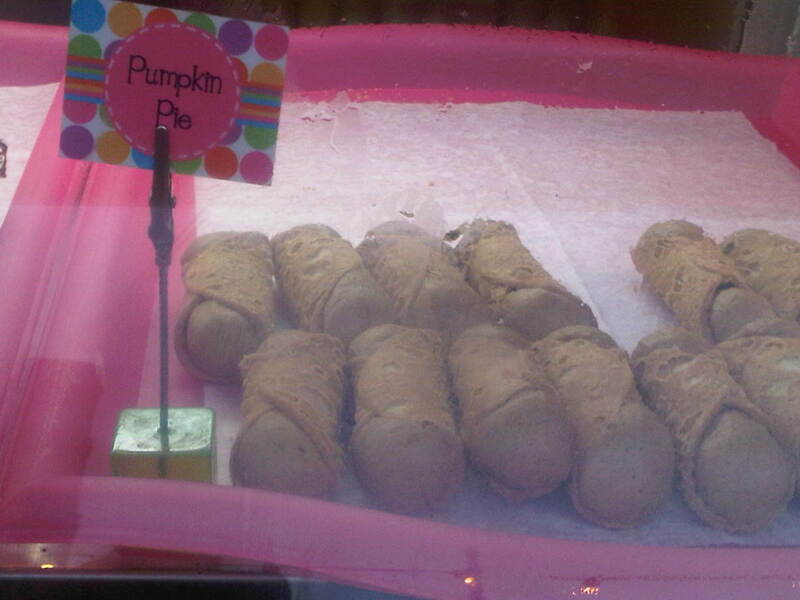 I was just seeking this Cannoli for some time. After 6 hours of continuous Googleing, at last I got it in your website.